Do you want the best information related to buying and training on your new treadmill? Of course you do! Check out some of our top articles below. New topics are also added regularly on our Treadmill Ratings & Reviews Blog. Finally, be sure to check out our Best Buy Treadmill page for the latest and greatest in treadmill technology in all pricing categories. 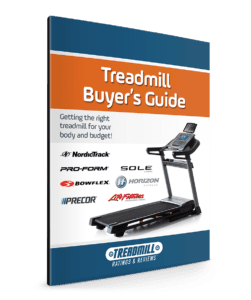 Treadmill Buyer’s Guide – There are many treadmill models out there, but some are not worth your time. Learn about treadmill features so you can find the best models! How to Select the Best Running Treadmill for Your Body and Budget – Learn Treadmills 101. This free downloadable eBook will let you get a jump start on your shopping. Which Brand Offers the Best Quality? – Learn about our top rated treadmill brands. Also, find out which brands to stay far away from. Treadmills vs. Elliptical Trainers – Are you trying to decide between a treadmill and an elliptical? This article will help you figure out the best option for your goals. The Benefits of a Treadmill for Running – More reasons why a treadmill is a great addition to your home! What Type of Treadmill is Best for You? What to Consider in a Folding Treadmill – Folding treadmills are great for saving space, but there are a number of consideration before you buy. The Pros and Cons of Compact Treadmills – If you have limited space a compact treadmill may be an option, but there are compromises. Walking Workout: NordicTrack Incline Trainer vs. Bowflex Treadclimbers – If you’re looking for a unique machine that can target your lower body muscles with just walking, read this! iFit Live Review: Your Virtual Personal Trainer Treadmill technology has come a long way in the last decade and iFit is at the head of the pack. Here’s our review. iFit Treadmills: How Does iFit Work? Learn about one of the top technologies currently on the market to enhance your treadmill experience. The Importance of a Treadmill Warranty – This article covers the importance of treadmill warranties and how they reflect the quality of the machine. Treadmill Delivery: What You Need to Know – All treadmill delivery options are not created equal. Learn what to look for and how to avoid a major ‘set up’ headache. A Guide to Buying Treadmill Mats – Want to protect your floors? Learn about treadmill mats. Used Treadmill Ratings and Reviews – We’ve been providing treadmill reviews for more than 12 years. Many used models are no longer on the market so here’s list of the oldies but goodies. The 30-Minute Fat Blasting Treadmill Program – It can be hard to fit in a workout so here is a fat blasting program that only takes half an hour! Walkers: Here Are 3 Tools to Help You Get More Out of Your Treadmill Workout – You can get amazing results by just walking on a treadmill. Learn about particular models that work best. Heart Rate Control for Your Treadmill: Do You Need It? – Find out how heart rate control can optimize your workout. High Intensity Interval Training. Learn about the hands down most effective way to lose weight and gain muscle. Now HIIT workouts are easier than ever on a treadmill! Weights Before Cardio: Stop Working Against Yourself – The order of your workout does make a difference. Learn how. Make a Good Run at Ideal Body Mass Index – Learn everything you need to know about BMI and what it means for your body. Sole F80 vs. NordicTrack Commercial 1750 Treadmill – Here’s a comparison between two of our top recommended machines. The Ideal Running or Walking Surfaces – Learn how different surfaces impact your body over time. Remember to check out our Treadmill Best Buys page for our most recent list of top treadmills in each pricing category. Plus, learn more about How We Determine Our Treadmill Reviews and Ratings.